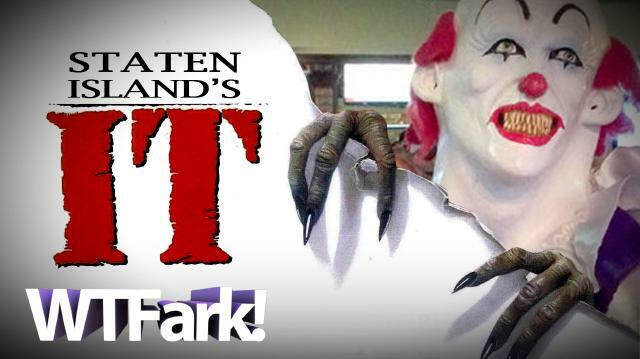 STATEN ISLAND'S "IT": Media Falls For Movie Company's Creepy Clown Stunt. No, The Media?! More from Ora: TO CATCH A MORON: Crook Caught After He Drops ID During Robbery. ON TAPE! LIVE! NEWS! A creepy-clown man has been roaming the streets of Staten Island, New York! Local media and news stations were quick to jump on the story of the alleged balloon-animal-making serial killer, but it was all just a movie company stunt. Go farkin' figure. TO CATCH A MORON: Crook Caught After He Drops ID During Robbery. ON TAPE! LIVE! NEWS! THE LAST VACCINATION OF CHRIST: Doctor Busted Selling $300 Cure-All-Pain “Jesus Shot"